Brooke Whitmore holding a bunch of knitted flowers with Amanda Viviers in the background at one of the trees. 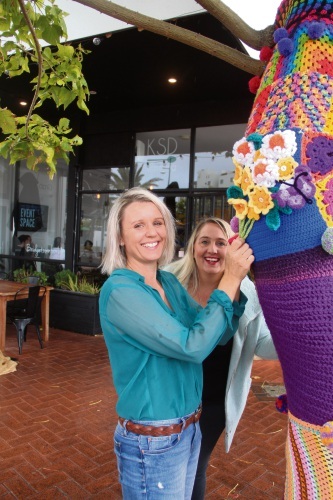 A LOVE of trees has seen two very special ones on Kent Street wrapped up in colourful garb after a recent ‘yarn-bombing’ incident. The ‘bombing’ was instigated after February’s freak storm where 130km/h wind gusts left a trail of destruction. Two of its victims – a pair of trees that permanently reside at the front the Kent Street Deli – were badly affected. With branches ripped off and debris everywhere their plight was upsetting for customers of the business. Kent Street Deli owner Brooke Whitmore was surprised by the response. “We lost two big chunks from our trees and to say we were devastated is an understatement,” she said. “We lost our shade, ambience and we loved the big presence they brought to our streetscape. Enter yarn -bombing, a relatively new form of streetscape art where knitted and crocheted wool is used to brighten up an area. Setting up a help page, the deli settled on a yarn-bombing event on April 7 with the help of concerned locals. “We held a free community craft event supplying the creatives with free, tea, coffee and nibbles on the day,” Mrs Whitmore said. Mrs Whitmore and author Amanda Viviers will be hosting a free winter craft festival in July. “The Winter Creative Festival partners with businesswomen in the Rockingham region,” she said. “We aim to create a safe environment for collaboration, inspiration and encouragement through the season of winter.